Come experience the Blue Hill Peninsula! Each year we search for adventures and experiences that offer guests a special touch of the Maine magic. Blue Hill is convenient for exploring the small seaside villages and coastline of the secluded and beautiful peninsula or for day-tripping to Acadia National Park, Bar Harbor, Camden, or Downeast Maine. Hiking, biking, kayaking, boating, sailing, whale watching, sightseeing, listening to concerts, ogling in art galleries, antiquing, flying, and exploring islands and lighthouses by foot, car, and boat are all area activities that guarantee guests will leave filled with the wonder of the Blue Hill Peninsula. Helping plan fabulous experiences and adventures is a specialty of the inn and available to all guests before and during their stay. Below is just a selection of special events and attractions. Specific dates are listed for some events, while others are available throughout the season. Some of the calendar events require advance reservations. May 19-21. The Wings, Waves, and Woods Festival , Deer Isle , offers “birding by land, by sea, and by art.” Stay at the inn the week before or after this fun weekend for two or more nights and receive a complimentary copy of Birds of Maine. Just ask for it when you make your reservation. We love Birds of Maine so much we will give you a copy if you stay with us during Acadia’s birding festival, May 28-31, too—just ask when you make your reservation. May 27. Plant Sale Fundraiser for the Blue Hill Public Library. Plants of all sorts, baked goods, silent auction—this fun annual event is popular so plan to arrive early if you have your gardening gloves set on something in particular. The library is a short walk from the inn and we can have your purchases delivered if they are too heavy to carry back. May 29. Flash in the Pans! Steel Drum Street Dance. Join the whole community as we celebrate spring and the Peace Ridge Sanctuary in this fundraising street dance at the town park, a short walk from the inn. June 1-4. The Acadia Birding Festival. Explore Mount Desert Island and its birds through numerous events and venues. June 12. Flash in the Pans! Steel Drum Street Dance. Join the whole community as we celebrate spring and Healthy Peninsula at the Blue Hill Town Park, a short walk from the inn. June 17-19. Lupine Festival in Stonington is an Island-wide activity including trail walks on Island preserves, boat tours, puffin boat trips, airplane rides, artists/artisans exhibits, business booths, kid’s activities. June 24. Orland River Day, Orland, is a family adventure day with a parade, magic show, capsizing kayaks, raft races, live music, and more. June 23. Kneisel Hall Festival Concert Program One - Continuum Concert featuring works by Brahms, Wernick and Schoenberg at their school on Pleasant Street in Blue Hill. June 26 Flash in the Pans! 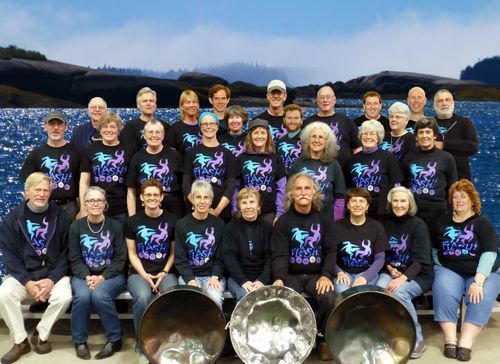 Steel Drum Street Dance will be playing on the Castine Town Dock and be celebrating the Castine Womens Club and all that they offer the community. June 28. Keisel Hall Children's Concert at the Blue Hill Public Library just a short walk from the inn. June 30. First Friday Blue Hill is your opportunity to explore art openings, live music, fun food happenings—all just a stroll around Blue Hill. June 30 & 7/2. Kneisel Hall Festival Concert Program Two - Schubert: Fantasy for Violin and Shostakovich Sonata for Cello and Piano at their school on Pleasant Street in Blue Hill. July 1. First Friday Blue Hill is your opportunity to explore art openings, live music, fun food happenings—all just a stroll around Blue Hill. July 3. Blue Hill Pops, Blue Hill, is held in the George Stevens Academy gymnasium (across the street from the inn). A benefit for the Bagaduce Music Lending Library, this annual musical festival celebrates "Sounds Around Blue Hill" and features singer/songwriter Don Campbell. Other performers will include Velocipede, a violin and guitar duo, the Big Moose Contra Dance Group and the Bagaduce Pops Singers. July 4. You’ll find small town patriotism and firework displays from Stonington to Castine to Bar Harbor. July 4. Flash in the Pans! Steel Drum Street Dance. Join the whole community as we celebrate Independence Day and help support steelband and music in our classrooms with the FLASH Scholarship Fund with a street dance at the town park, a short walk from the inn. July 5. Keisel Hall Children's Concert at the Blue Hill Public Library just a short walk from the inn. July 7 & 9. Kneisel Hall Festival Concert Program Three. Featuring selections from Mozart, Ravel, Robert Mann, Sibelius and Schumann. Performances at the school on Pleasant Street in Blue Hill. Tickets required. July 11. Flash in the Pans! Steel Drum Street Dance. Join the whole community as we celebrate summer and help support steelband and music in our classrooms with Peninsula Pan in this fundraising street dance at the town park, a short walk from the inn. July 14. Fireworks. In Castine, as part of the the historical celebration of Bastille Day with a community picnic. July 14. First Friday Blue Hill is your opportunity to explore art openings, live music, fun food happenings—all just a stroll around Blue Hill. July 14-17. Quietside Flamingo Festival, Southwest Harbor, is a whimsical, lighthearted and decidedly hot pink family festival. Over the years, it has become a way for the community to come together to celebrate the treasured value of small town life. Young, old and in-between, locals, summer people and tourists, all participate in the festivities, and lawns, store windows and buildings proudly display the plastic pink creatures. July 15. Paint the Peninsula, Blue Hill Public Library’s gala fundraising auction brings together more than 70 local artists. Opening bids range from $50-$350 making Paint the Peninsula a great opportunity to start buying local art or to add to an established collection. Most artists donate 50% of the sale to the library and some do more, so winning bids support both the Blue Hill Library’s operating budget and the local arts community. July 16. Fishermens Day in Stonington created by the Island Fishermens Wives Association is an annual Family Fun Day on the pier in Stonington. Enjoy carnival games, contests, local artisans and vendors and some delicious seafood. July 17. Fishermen’s Day, Stonington, has family fun on the Stonington Fish Pier with crafts, slippery cod contest, whacky boat races, great music, and lots of food. July 18. Kneisel Hall Chamber Music Festival, Blue Hill, begins their summer program with concerts each weekend and events all week long. July 20-22. Blue Hill Bach Festival is a celebration of history, culture, and exquisite musical talent. Check the schedule—the very creative performances sell out quickly. July 22-24. Bucksport Bay Festival, Bucksport has something for everyone with a line up of live music, a classic car and motorcycle show, a fun run, and a kids’ area. July 24. Flash in the Pans! Steel Drum Street Dance. Join the whole community as we celebrate summer in this street dance at the town park, a short walk from the inn. A fundraising event for FLASH Scholarship Fund. July 31. Flash in the Pans! Steel Drum Street Dance. Join the whole community as we celebrate summer in this street dance at the town park, a short walk from the inn. A fundraising event for the ARK Animal Shelter. July 31-August 13. Schoodic Arts Festival, Winter Harbor, is a two-week celebration of arts and culture, including more than 60 workshops, over 20 evening performances, free brown bag lunchtime performances, an art show, a silent auction, and more. August 5. 6th Annual Blueberry Festival at the First Congregational Church of Blue Hill. Blueberries reign at this local festival, a short walk from the inn. The blueberry shortcake is amazing. August 3. Flash in the Pans! Steel Drum Street Dance. Join the whole community as we celebrate summer in this street dance at the town park, a short walk from the inn. August 4. First Friday Blue Hill is your opportunity to explore art openings, live music, fun food happenings—all just a stroll around Blue Hill. August 5. Eggemoggin Reach Regatta. Over 100 wooden boats vie for bragging rights as they race off Naskeag Point. Aug. 11-13. Deer Isle Jazz Festival, Stonington, has events at the Opera House. August 14. Flash in the Pans! Steel Drum Street Dance. Join the whole community as we celebrate summer in this street dance at the town park, a short walk from the inn. August 21. Flash in the Pans! Steel Drum Street Dance. Join the East Blue Hill community at the playground to benefit the East Blue Hill Library. August 28. Flash in the Pans! Steel Drum Street Dance. Join the whole community as we celebrate summer in this street dance at the town park, a short walk from the inn. Sept. 1, Windjammer Festival, Camden, is a celebration of maritime heritage and living traditions. The fleet gathers in picturesque Camden Harbor for festivities reminiscent of the days when hundreds of coastal schooners lined the waterfront. Festivities include a parade of sail, flag-raising ceremonies, live music, dancing and fireworks. Aug 31-Sep 4, Labor Day Weekend, the Blue Hill Fair is an old-time country fair that was the origin of the fair in Charlotte’s Web, written by the frequent inn guest E. B. White. Sheep dog trials and oxen and horse pulls are just a few of the many events. The fair is held at the Blue Hill Fairgrounds about five miles from the inn. September 4. First Friday Blue Hill is your opportunity to explore art openings, live music, fun food happenings—all just a stroll around Blue Hill. September 9. Maine Open Lighthouse Day. We love Maine Open Lighthouse Day. When you make your reservation, let us know you love lighthouses, too, and you’ll receive a package of information about Maine lighthouses, including a state map with the history of each lighthouse. You can explore the region and find ways to spot all eight of the closest lighthouses. Whether by car, boat, or plane, catching the lights and exploring the coast during the beautiful September weather will make for a memorable trip to Blue Hill. Lights include Robinson Point Light, Isle au Haut; Saddleback Light, remote; Brown’s Head Lighthouse, Vinalhaven; Goose Rocks Light, Fox Island Thoroughfare; Heron Neck Light; and Mark Island Light, Deer Isle Thoroughfare. Inn staff can assist with all your sightseeing plans. Sept. 22-24. The Common Ground Country Fair, Unity, is a celebration of rural life. It features demonstrations, Maine organic produced foods and crafts and livestock exhibits. October October 6. First Friday Blue Hill is your opportunity to explore art openings, live music, fun food happenings—all just a stroll around Blue Hill. October 1. Get a personalized tour of Nervous Nellies on Deer Isle. Taste jams, see the art and sculpture gardens. October 20-22. Word. Blue Hill Literary Arts Festival, an annual event that fosters and celebrates the community of readers and writers on the Blue Hill Peninsula featuring workshops and fun events all weekend. On Sunday, October 8, you can visit us and oodles of local purveyors of fine things at the Taste of the Peninsula right here in Blue Hill. Also during the week, we will partner with the team at El El Frijoles and Max from the Blue Hill Wine Shop to offer you a wine dinner with a Latin twist. Check with us for the full schedule. Off-season availability of the Cape House Suite and Studio, November-May The Cape House Suite, a small apartment with living room/bedroom area, fully equipped kitchen, large bath, wood burning fireplace, and deck is available year-round. The Studio is a smaller version, with a kitchenette, large bath, and bedroom/sitting area. We leave the kitchens stocked with breakfast goodies and snacks as well as the inn’s great coffee. And next to the reading chairs? Our local papers so you can see all that’s happening. Check the reservation calendar for availability and rates. Please call for rates for extended stays. The Blue Hill, Maine, area offers a bit of everything. You’ll find a partial listing here. Sarah Pebworth and her staff will have updated information, or will find it for you, and can make recommendations and reservations for you. You may find (doesn’t seem to exist anymore?) the local chamber and the local newspaper informative as well. June-August, Friday evenings and Sunday afternoons Kneisel Hall is internationally known with students from around the world. The faculty, all accomplished musicians from across the United States, performs twice-weekly concerts in a small hall nestled in an idyllic wooded setting, within walking distance of the inn. Concerts are often sold out and pre-season reservations are recommended. We will purchase tickets for you upon request. Historic Sites and Museums June-September 15th, various hours The Blue Hill, Maine, area is rich in history and has preserved many homes of early, distinguished colonists. Volunteers generally staff museums and homes and the times they are open varies. As the volunteers are typically very enthusiastic about the local history, the inn can sometimes arrange for private showings with advanced notice. In Blue Hill take a tour of Jonathan Fisher’s Home (the first minister of Blue Hill, inventor, eccentric, learned man from Harvard) and the Holt House, home to the Blue Hill Historical Society and a well-restored 18th century homestead. In Castine tour the Wilson Museum, with its John Perkins House, Blacksmith Shop and Hearse House, or the Historical Society at the Abbot School. In Ellsworth visit the Woodlawn Museum, home of Colonial Black. Hike the paths, tour the home, attend the farmers market, or reserve for an afternoon of croquet. Venture to the Cornelia Stanwood Museum and Birdsacre Wildlife Sanctuary to explore the 100 acres, the noted ornithologist’s homestead, and the bird sanctuary. The least opened museum, but a fascinating one, is the Granite Museum in Stonington. It is generally open in July and August.